Category 2: Heritage: Photos that evoke emotions or memories of the past, especiallyyour hometown/motherland. Culturally-revealing & inspiring, or just plain striking. Broadly speaking, it can be an events, locales or activities connecting to their history or their cultural heritage. 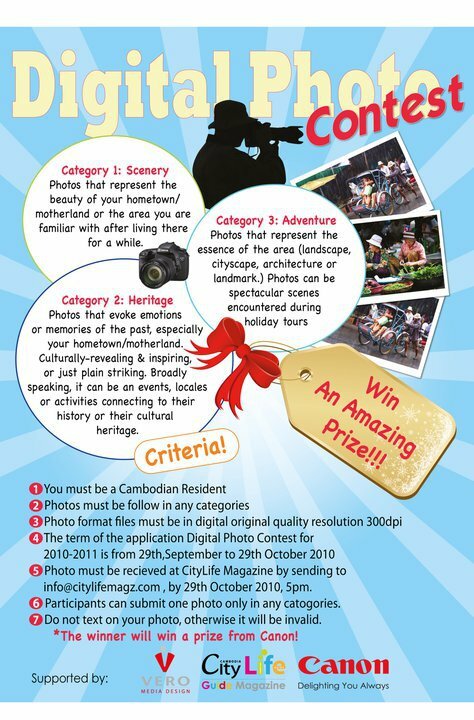 5 Photo must be recieved at CityLife Magazine by sending to info@citylifemagz.com , by 29th October 2010, 5pm. 6 Participants can submit one photo only in any catogories. 7 Do not text on your photo, otherwise it will be invalid. *The winner will win a prize from Canon!